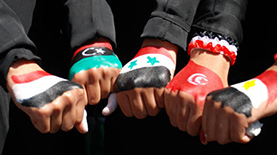 The Arab Spring is a term for the revolutionary wave of demonstrations and protests (both non-violent and violent), riots, and civil wars in the Arab world that began on December 18, 2010. By December 2013 rulers had been forced from power in Tunisia, Egypt (twice), Libya, and Yemen; civil uprisings have erupted in Bahrain and Syria; major protests have broken out in Algeria, Iraq, Jordan, Kuwait, Morocco, and Sudan; and minor protests have occurred in Mauritania, Oman, Saudi Arabia, Djibouti, Western Sahara, and the Palestinian Authority. The protests have shared some techniques of civil resistance in sustained campaigns involving strikes, demonstrations, marches, and rallies, as well as the effective use of social media to organize, communicate, and raise awareness in the face of state attempts at repression and Internet censorship. Some observers have drawn comparisons between the Arab Spring movements and the Revolutions of 1989 (also known as the “Autumn of Nations”) that swept through Eastern Europe and the Second World, in terms of their scale and significance. Others, however, have pointed out that there are several key differences between the movements, such as the desired outcomes and the organizational role of internet technology in the Arab revolutions.